We left at 6:45am Tuedsay, December 17, 2013 from South Caicos, Turks & Caicos. The wind was coming from the exact direction we needed to go, so we had to tack all day. We started with large 10 mile tacks and changed to 1.5 mile tacks to keep us more or less on a straight line through some banks. If you were the one on watch we still had to tack every 1.5 miles off course and had to wake another person up every hour and a half to tack and then that person would go back to bed. This made for even less sleep for all of us. During the day we would all take a nap at some point. I spent most of the 2nd and 3rd days reading Lone Survivor out loud to entertain everyone. On days 1,2, & 3 I was able to cook all the meals still and we were cruising along. On the night of day 3 the wind started picking up and the seas started building. 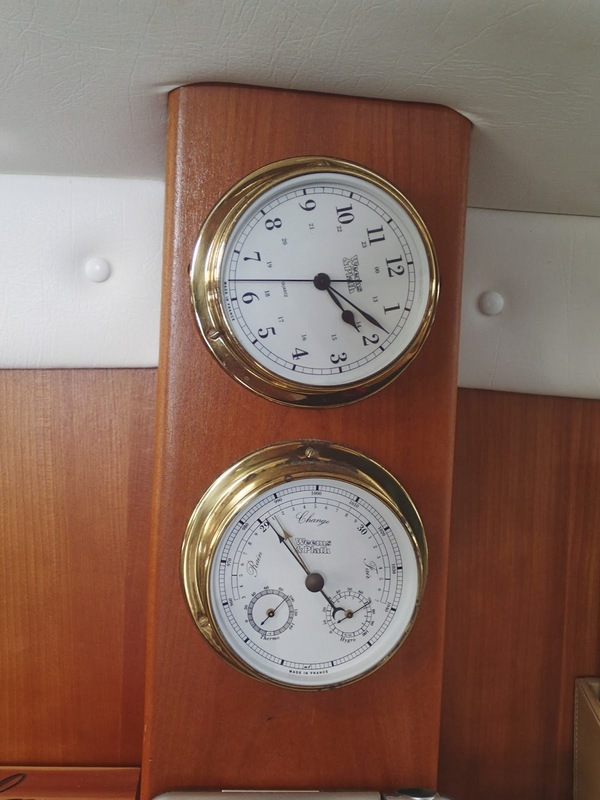 By the time my watch started we had the motors running to keep us moving through the big swells. By 3:00am we were heading straight into the 8 foots waves and hating every second. When the sun came up we decided to change course and head the 75 miles to Puerto Rico instead of 175 miles left to get to the Virgin Islands. This also put the wind and waves on the beam of our boat which was scarier for me, but a little more comfortable. There is nothing scarier than watching 10-12 foot waves built up off the side of your boat and then crashing over the side spraying hundreds of gallons of water over the boat while it tilts the boat sideways to roll beneath it. This left us tilted the other direction headed for the trough of the waves. We were to say the least being thrashed about from every direction, rocking, rolling, pounding into wave after wave. I was so nervous I could not take a shift to drive the boat, because the anticipation of each wave building gave me a panic attack. Every window was leaking despite the fact that Preston fixed all the seals before we left. There were towels and rags on all the floors, bungees holding most things down, and I was constantly hearing something new hit the floor. The picture below best described how we all felt after our day Friday. We pulled into Puerto Rican waters just after midnight and I was getting ready to take my shift now that we were tucked in on the West side of Puerto Rico when a boat came out of no where with no lights on and started circling our boat. All we could see was a white wake and the dark boat going around us. After a few minutes they turned on a spotlight and circled us again shining the light on us so we couldn’t see. We had to stop the boat not able to see where we were going and that is when the decided to flip on their familiar blue flashing lights. We were being pulled over at 12:30am 3 miles off Puerto Rico after a day from hell and all we wanted to do was drop anchor and go to bed. Now we sat idley by for 20 minutes as they tried to tie up to us to ask us what we were doing. Once they came aboard and made sure we didn’t have 100 Hatians onboard they were a pleasure to talk to. I tried to explain that we weren’t planning on stopping here and that is why I hadn’t alerted customs we were coming. He wanted me to call right then to get checked in and didn’t understand why I didn’t have a cell phone to call with. He let me use his and we got the okay to anchor for the night. While I was dealing with all the paperwork and official stuff Dan and Preston were talking with the other officers. Turns out they had been watching us for quite a while at first thinking we were the coast guard and then deciding to try to scare us by pretending to be Somali pirates. They got a real laugh when I told them they were making me nervous circling our boat in complete darkness. We said goodbye and headed to the bay they were going to let us anchor in. We pulled in around 3:00am, dropped the anchor, took showers, put new sheets on the bed, and slept for a full 9 hours in glassy water. WE LOVE PUERTO RICO!!!! at least you didn't get a ticket for speeding! You are giving me a heart attack just reading this post. How scary!! I think you guys should come home now. But very happy you are safe and sound in beautiful Puerto Rico! I love the pic of Dan driving the boat. Haha. I have heard it said that Puerto Rico is an wonderfully friendly place. Even with the weird Customs cops, I am glad to hear its true.